Most hardwood flooring advertised as â€œhand-scrapedâ€ these days isnâ€™t hand-scraped at allâ€”itâ€™s scraped by machines to appear hand-scraped. The patterns and marks are repetitive, and look â€œfakeâ€ when spread across your floor at home. Bella Cera flooring, on the other hand, is truly hand-scraped flooring. Hardwood floor artisans, personally trained by a world-renowned expert, â€œreadâ€ each board and use hand tools to bring out its unique personality with distinctive, natural-looking hardwood characteristics. With quality hardwood flooring, the gap between the â€œtonguesâ€ on board edges and the grooves they fit into is less than 0.15 MM. This tight attachment eliminates the creaking you find with cheap hardwood flooring when it is walked upon. 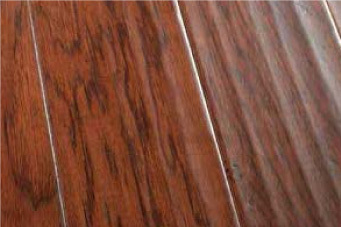 Quality hardwood flooring uses Taier E1 glue between layers, with a very low level of formaldehyde. 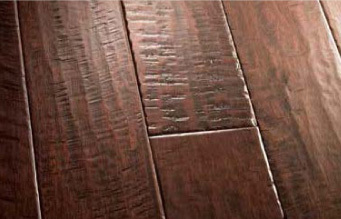 Bella Cera flooring, for example, conforms to CARB, with a formaldehyde level far below its guidelines. Vapors from cheap glues can be harmful to your health! Long planks are more expensive to produce, but make a more beautiful floor. Short boards can look like shoeboxes when placed in a floor. Cheap wood flooring typically includes too many short planks, with boards as small as one foot in length. But quality hardwood flooring uses longer planks. Bella Cera, for example, includes boards up to seven feet in length, with the average being over three feet.